I read this article and found it very interesting, thought it might be something for you. The article is called Do Immigrants Import Their Economic Destiny? 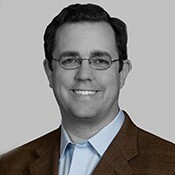 and is located at http://evonomics.com/do-immigrants-import-their-economic-destiny-garrett-jones/. The New Voters-New Policies literature, which shows that expanding the franchise to new voters really does change the nature of government. A glance at the map tells much of the tale: Today’s rich countries tend to be in East Asia, Northern and Western Europe, or are heavily populated by people who came from those two regions. The major exceptions are oil-rich countries. East Asia and Northwest Europe are precisely the areas of the world that made the biggest technological advances over the past few hundred years. These two regions experienced “civilization,” an ill-defined but unmistakable combination of urban living, elite prosperity, literary culture, and sophisticated technology. Civilization doesn’t mean kindness, it doesn’t mean respect for modern human rights: It means the frontier of human artistic and technological achievement. And over the extremely long run, a good predictor of your nation’s current economic behavior is your nation’s ancestors’ past behavior. Exceptions exist, but so does the rule. A growing body of new empirical work focuses on the measurement and estimation of the effects of historical variables on contemporary income by explicitly taking into account the ancestral composition of current populations. The evidence suggests that economic development is affected by traits that have been transmitted across generations over the very long run. [W]e are measuring the association of the place’s technology today with the technology in 1500 AD of the places from where the ancestors of the current population came from…[W]e strongly confirm…that history of peoples matters more than history of places. 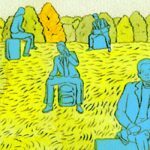 The positive effect of ancestry-adjusted early development on current income is robust…The most likely explanation for this finding is that people whose ancestors were living in countries that developed earlier (in the sense of implementing agriculture or creating organized states) brought with them some advantage—such as human capital, knowledge, culture, or institutions—that raises the level of income today. S: How long ago the nation’s ancestors lived under an organized state. A: How long ago the nation’s ancestors began to use Neolithic agriculture techniques. T: How much of the world’s available technology the nation’s ancestors were using in 1000 B.C., 0 B.C., or 1500 A.D. When estimating each nation’s current SAT score, it’s important to adjust for migration: Indeed, all three of these papers do some version of that. For instance, without adjusting for migration, Australia has quite a low ancestral technology score: Aboriginal Australians used little of the world’s cutting edge technology in 1500 A.D. But since Australia is now overwhelmingly populated by the descendants of British migrants, Australia’s migration-adjusted technology score is currently quite high. On average, nations with high migration-adjusted SAT scores are vastly richer than nations with lower SAT scores: Countries in the top 10% of migration-adjusted technology (T) in 1500 are typically at least 10 times richer than countries in the bottom 10%. If instead you mistakenly tried to predict a country’s income today based on who lived there in 1500, the relationship would only be about one-third that size. 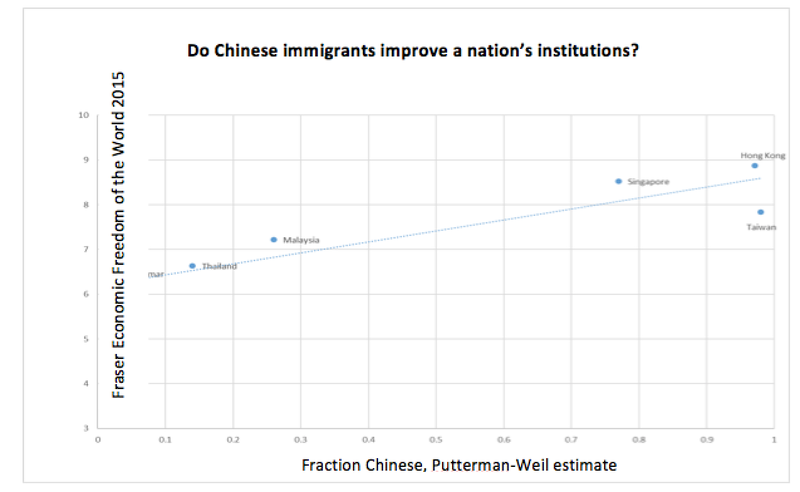 The migration adjustment matters crucially: Whether in the New World, across Southeast Asia, or in Southern Africa, one can do a better job predicting today’s prosperity when you keep track of who moved where. It looks like at least in the distant past, migrants shaped today’s prosperity. Do migrants bring their institutions with them? [N]ations that were more developed in the pre-modern era tend to have better institutions today. [M]easures adjusted for the global migration effect perform significantly better than their unadjusted counterparts in explaining the variation in institutions across countries, thus highlighting the fact that migration has played a significant part in shaping current economic performance. One wonders: If migration shaped institutions in the past, perhaps migration will shape institutions in the future. Or perhaps not: while violent European colonizers imposed their institutions and their culture on lands that had belonged to Native Americans, perhaps peaceful mass migration in the 21st century will leave today’s institutions and culture undisturbed. Perhaps, to coin a phrase, this time really is different. 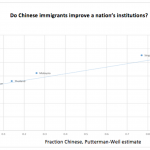 Notes: The x-axis data come from the Putterman-Weil global migration matrix, reflecting post-1500 flows of Chinese migrants to these nations. The y-axis data come from the Fraser Economic Freedom of the World Index. The correlation is 0.9, significant at conventional levels with a sample size of seven. Results are little-changed if the Rauch/Trinidade Chinese ethnicity measures are used instead of Putterman-Weil. The graph is truncated at three because no nation on earth has an economic freedom score below three. Overall, the relationship between a nation’s percent population of Chinese descent in 1980 and current economic freedom is strongly positive. Singapore, Hong Kong, and Taiwan, the countries with the largest percentage of post-1500 Chinese immigrants, are the freest. Hong Kong, which had only a few thousand Chinese residents before the British arrival, is now the economically freest country in the world. Malaysia (a third of whose residents are of Chinese descent) and Thailand (10 percent) are next, and Malaysia is clearly the freer of the two. The remaining countries, Laos and Myanmar, are substantially less economically free than Singapore. Of course, including China in this graph would weaken the relationship, but to repeat: we aren’t interested in ancestry per se, but in relatively peaceful migration. So, how do migrants change the governments in countries they move to? For a partial answer, we can look at the Attitude Migration literature. The simplest approach is to see if the descendants of, say, Italian migrants to America tend to have the same attitudes toward government as Italians living back in Italy. If they do have similar attitudes, then there really is such a thing as “Italian attitudes toward government,” portable and relatively durable around the globe. Using the World Values Survey, we show both in a cross-section of countries, and in a sample of individuals from around the world, that distrust fuels support for government control over the economy. The authors suggest that this happens because in low-trust societies, people want someone checking up on untrustworthy businesses and individuals, and a strong government is one way to do just that. Together, this literature suggests that migration from low-trust societies will tend to hurt long-run economic performance, partly because low-trust individuals demand more government regulation. …on average familistic values are associated with lower political participation and political action. They are also related to a lower level of trust, more emphasis on job security, less desire for innovation and more traditional attitudes toward working women. …family values are quite stable over time and could be among the drivers of institutional differences and level of development across countries: family values inherited by children of immigrants whose forebears arrived in various European countries before 1940 [!] are related to a lower quality of institutions and lower level of development today. Of course immigrants don’t just become voters: they sometimes become taste-makers, opinion-setters. As immigrants join the culture, they start to shape the culture. That means that immigrants and their descendants may shape political opinions the way they often shape people’s opinion about food: Migrants start eating some of the foods of the country they move to, but at the same time older residents start trying some foods from immigrant cultures. There’s a mutual exchange, and behavior meets somewhere in the middle. As students of migration repeatedly claim, acculturation is a two-way street: America is different because of Italian and Irish migration, and not just because of the food we eat. To some extent, this point is obvious, but it has far-reaching implications. It means that one important way that immigrants and their descendants will shape a political system isn’t by directly bringing their own attitudes into the voting booth: It’s also by shaping the political attitudes of their fellow citizens. That’s what happens in a melting pot: We all become a little like each other. So if we really are shaped by our neighbors, then we have yet another good reason to choose our neighbors wisely. This means that the Attitude Migration channel is perhaps only half the story, but it also means that the other part of the story will be harder to detect. If a nation of 100 million has, say, a million migrants from a particular country, it would be hard to pick out the effect of those migrants on “native” attitudes: the effect of the migrants would be diluted partly because they’re only 1% of the population, and partly because the change in “native” attitudes will occur slowly over the decades. Migrants and their descendants seem to make their new homes quite a bit like their old homes. Migrants and their descendants tend to influence the attitudes of their new fellow citizens, so that all groups in society become at least a bit more like each other. We’ve seen that in the extremely long run immigrants have dramatically changed the countries they’ve moved to; and in the medium run we’ve seen that immigrants and their children bring home-country attitudes along for the ride. But as I’ve already noted, some critics will argue that perhaps “this time is different”, and that even if immigrants import their cultural attitudes to their new homes, maybe they’ll leave those views just outside the voting booth. Perhaps, when it comes time to vote, migrants completely conform to their new home countries. to rise immediately by 14 percent…by 21 percent after 25 years, and by 28 percent after 45 years. Women did not quietly, meekly vote for whatever the men around them supported. They had their own minds, and those minds, when empowered by the vote, moved policy in a more progressive direction. And notice that the longer-run effect was twice the immediate effect: Expanding the franchise to a group that favored more government spending indeed increased government spending, but it took decades to see the full effect. In U.S. history, new voters have mattered. Using historical data from six Western European countries for the period 1869-1960, we provide evidence that social spending out of GDP increased by 0.6-1.2% in the short-run as a consequence of women’s suffrage, while the long-run effect is three to eight times larger. Again, the long run effect matters more than the short run effect. New voters, new policies: NVNP. Which brings us to one last test of the NVNP hypothesis: The increase in voting rights for when poll taxes were eliminated in the United States. Here again, evidence supports NVNP: the University of Chicago’s Journal of Political Economy reports that “eliminating poll taxes raised welfare spending by 11 to 20 percent” among other findings, so once again, new voters made important progressive policy change a reality. The Deep Roots literature which shows that in the long run, migration deeply shapes a nation’s level of pro-market institutions, and that a nation’s ancestry-adjusted SAT score (States, Agriculture, Technology) is a good predictor of prosperity. The Attitude Migration literature, which shows that migrants bring a substantial portion of their attitudes toward markets, trust, and social safety nets with them from their home country. The New Voters = New Policies literature, which shows that governments really do change when new voters show up, and that the changes start to show up in just a few years. Government policies don’t radiate from subterranean mineral deposits: they are in large part the product of its voting citizens. And in the long run, new citizens lead to new policies. Together, these three literatures provide a combination of big-picture and close-up evidence that if a country is choosing between high-SAT and low-SAT immigration policies, the high-SAT approach will yield big benefits in the long run. Individual countries will always be exceptions to the rule, so some countries taking the low-SAT immigration path will still look pretty good. But wise citizens don’t bet on being the exception: they bet on being the rule.